The Thunder Bay area is known for its amethyst mines and the particular rich purple of the area's native crystals caused by hematite beneath the surface. The North Shore boasts some of the most beautiful and intriguing specimens in the world, and in the Gift Shop you'll find a selection of specimens, art and jewellery carefully selected with Liisa's eye for detail and quality. From classic drop pendants to funky, chunky bracelets, the jewellery collection is a trove of glistening purple stones. Ranged upon a bed of white fur, Liisa's display of specimens offers a wealth of glittering choice. 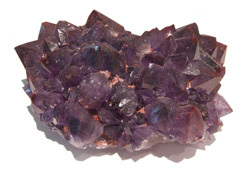 You'll find large and small crystals, amethyst stained with iron, amethyst with barite extrusions and a selection of shades from pale violet through rich reddish purple. You'll also find a case of other local semi-precious stones and jewellery in the Gift Shop, selected, like every piece in her shop, with Liisa's expert eye for fashion, value and geological interest.